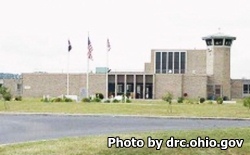 Southern Ohio Correctional Facility is located in Lucasville Ohio. It is a Maximum security prison that can house up to 1,625 inmates. Southern Ohio Correctional Facility houses some of the most violent and dangerous inmates in the state, some of which are mentally ill. Assaults, fights and a high use of force seem to dominate this facility, but is expected with a high security level of inmates. This facility operates a shoe shop that employs inmates and is part of the correctional industries. Educational opportunities at Souther Ohio Correctional Facility include adult basic education classes and the ability for inmates to obtain a GED. Additional vocational courses in building maintenance are also available to offenders. This facility allows use of their land for inmates of Ross Correctional Camp to farm. The food that is cultivated is donated to the Scioto County Homeless Shelter. Outpatient treatment for substance abuse is also available to inmates. Everyone must schedule a visit at least three days in advance by calling 740-259-5544 ext. 3208 from 9am-4:30pm Wednesday through Saturday. Visiting hours are on Wednesdays, Thursdays, Fridays, and Saturdays from 8:30am-5:30pm. Inmates can also have video visitation with people on their approved visitation list through JPAY. JPAY charges a fee for the thirty minute video visit and you must sign up on their website and schedule your visit at least three days in advance.